Used in daily hygiene, this xylitol nasal spray not only hydrates the sinuses, but actually helps to wash away bacteria and pollutants. Because Xlear is clinically proven to be helpful, ENT (Ears, Nose, and Throat) doctors, pediatricians, dentists, and other health care practitioners in over 20 countries are actively recommending Xlear Nasal Spray to their patients. 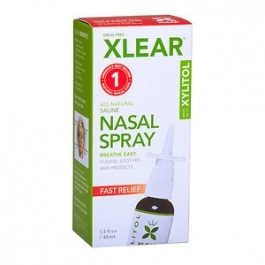 Clear the nasal passages by gently blowing your nose prior to using Xlear. Remove the cap on the bottle. Prior to initial use, prime the pump by holding it upright and pumping one or more times until the solution is dispensed. Insert the nozzle into nostril and depress pump completely while breathing in through your nose. Spray 1-2 times in each nostril. Clean nozzle after each use and replace safety cap. Use at least twice daily, morning and night.